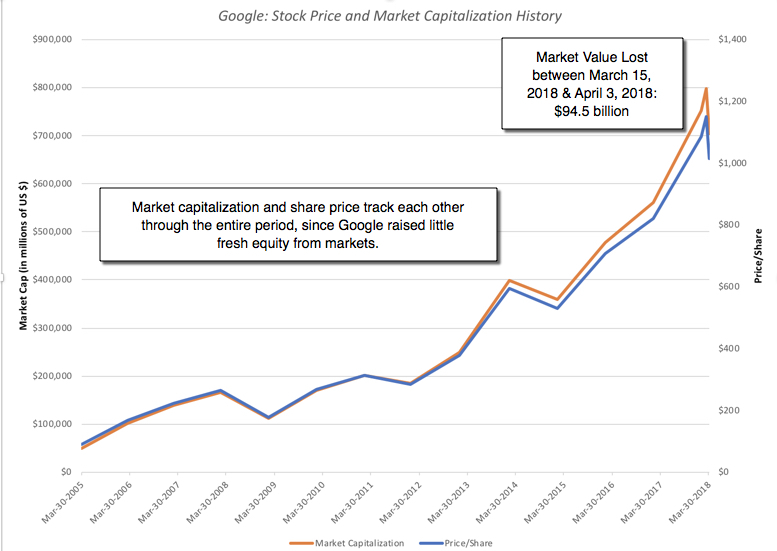 Musings on Markets: Alphabet Soup: Google is Alpha, but where are the Bets? In my last two posts, I looked first at the turn in the market against the FANG stocks, largely precipitated by the Facebook user data fiasco and then at the effect of the blowback on Facebook's value. I concluded that notwithstanding the likely negative consequences for the company, which include more muted revenue growth, higher costs (lower margins) and potential fines, Facebook looks like a good investment, with a value about 10% higher than its prevailing price. I argued that changes are coming from both outside (regulators and legislation) and inside (to protect data better), and these changes are unlikely to be just directed at Facebook. It is this perception that has probably led the market to mark down other companies that have built business models around user/subscriber data and in these next posts, I would like to look at the rest of the stocks in the FANG bundle and the consequences for their valuations, starting with Google in this one. Information Focus: We live in a world where we drown in data and opinion about companies and unfocused data collection can often leave you more confused about the value of a company, rather than less. Knowing the key value driver allows you to focus your information collection around that variable, rather than get distracted by the other inputs into value. Management Questions: If you have the opportunity to question management, your questions can then also be directed at the key variable and what management is doing to deliver on that variable. Disclosure Tracking: If you are invested in a company and are tracking how it is performing, relative to your expectations, it is again easy in today's markets to get lost in the earnings report frenzy and the voluminous disclosures from companies. Having a focus allows you to zero in on the parts of the earnings report that are most relevant to value. Big Value Effects: Changing your key driver variable should have large effects on the value that you estimate for a business. One of the benefits of asking what-if questions about the inputs into a valuation is that it can allow you to gauge this effect. Uncertainty about Input: If an input has large effects on value, but you feel confident about it, it is not a driver variable. Conversely, if you have made an estimate of input and are uncertain about that number, because it can change either due to management decisions or because of external forces, it is more likely to be a driver input. If you accept this characterization, there are two implications that emerge. The first is that the key value driver can and will be different for different companies; a mechanistic focus on the same input variable with every company that you value will lead you astray. The second is that there is a subjective component to your choice, and the key value driver that I identify for a company can be different from the one you choose for the same company, reflecting perhaps the different stories that we may be telling in our valuations. 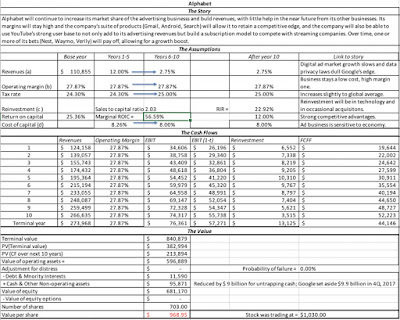 In my just-posted Facebook valuation, I believe that the key variable is the cost that Facebook will face to fix its data privacy problems and it manifests itself in my forecasted operating margin, which I project to fall from almost 58% down to 42%, in the next five years. Note that revenue growth may have a bigger impact on value, but in my judgement, it is the operating margin that I am most uncertain about. I will use this post to value Google and highlight what I believe is the driver variable for the company. If Facebook is the wunderkind that has shaken up the online advertising business, Google is the original disruptor of this business and is by far the biggest player in that game today. It is ironic that the disruptor has become the status quo, but until there is another disruption, it is Google's targeted advertising model, in world, and its search engine and ad words that dominate this business. Google has had fewer brushes with controversy, with its data, than Facebook, partly because its data collection occurs across multiple platforms and is less visible and partly because it does have a tighter rein on its data. 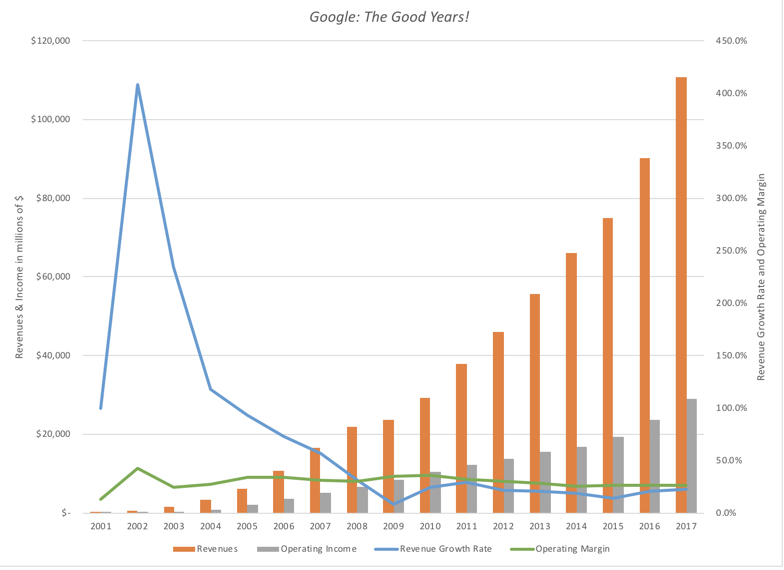 The most impressive feature of Google's operations has been its ability to maintain consistent revenue growth rates and operating margins since 2008, even as the firm more than quadrupled its revenues. To value Google, we start with the numbers, but in order to build a story we have to assess the landscape that Google faces. A Duopoly: The advertising business, in general, and the digital advertising business, in particular, are becoming a duopoly. In 2017, the total spent on advertising globally was $584 billion, with digital advertising accounting for $228.4 billion. Google's market share in 2017 was 42.2%, and Facebook's market share was 20.9%. Even more ominously for the rest of their competitors, they got bigger during the year, accounting for almost 84% of the increase in digital advertising during the course of the year. Google is everywhere: Google's hold on the game starts with its search engine, but has been enriched by its other products, Gmail, with more than a billion users, YouTube, which dominates the online video space and Android, the dominant smart phone operating system. If you add to this Google Maps, Google shared documents and Google Home products, the company is everywhere that you are, and is harvesting information about you at each step. During the last week, a New York Times reporter downloaded the data that Facebook had on him and while what he found disturbed him, both in terms of magnitude and type, he found that Google had far more data on him than Facebook did. Alphabet is still mostly alpha, very little bet: While Google's decision to rename itself Alphabet was motivated by a desire to let it's non-advertising businesses grow, the numbers, at least so far, indicate limited progress. In fact, if there is growth it has so far come from the apps, cloud and hardware portion of Google, rather than the bets themselves, but Nest (home automation), Waymo (driverless cars), Verily (life sciences) and Google Fiber (broadband internet) are options that may (or may) not pay off big time. The bottom line is that Google has changed the advertising business and dominates it, with Facebook representing its only serious competition. It's large market share should act as a check on its growth, but Google has been able to sustain double digit growth by growing the digital portion of the advertising business and claiming the lion's share of that growth, again with Facebook. The wild card is whether the data privacy restrictions and regulations that are coming will crimp one or both companies in their pursuit of ad revenues. As digital advertising starts to level off, Google will have to look to its other businesses to provide it a boost. As with Facebook, I was a doubter on the scalability of the Google story, but it has proved me wrong, over and over again. In valuing Google, I will assume that it will continue to grow, but I set the revenue growth rate at 12% for the next five years, below the 15% growth rate registered in the last five, for two reasons. The first is that digital advertising's rise has started to slow, simply because it is now such a large part of the overall advertising market. The second is that data privacy restrictions, if restrictive, will take away one of Google's network benefits. I do think that the profitability of Google's businesses will stay intact over time, with operating margins staying at the 27.87% recorded in 2017. With those key assumptions, I value Google at $970, close to the price of $1030 that it was trading at on April 13. No surprises here. The median value is about $957 and at a stock price of $1.030, there is a 65% chance that the stock is over valued. As with Facebook, there is a positive skew in the outcomes, and that skew will get only more positive, if you build in a bigger payoff from one of the bets. 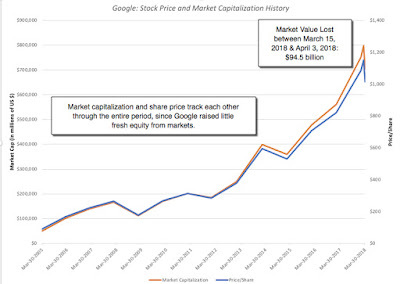 Google's value is driven by revenue growth and operating margins, and changing one or both inputs has a significant effect on value. The shaded cells represent the combinations that deliver values higher than the prevailing stock price of $1,030/share. In my judgment, Alphabet's bigger value driver is revenue growth, not margins, and it is on that input, this valuation will rise of fall. It is my view that while data privacy restrictions will translate into much higher costs for Facebook, partly because it has so little structure currently, it will result in lower growth for Alphabet. If the data privacy restrictions handicap Google so badly that it loses a big part of what has allowed it to dominate digital advertising for the next five years, Google's revenue growth and value will drop dramatically. However, Google is just starting to tap the potential in YouTube, and if it is able to position it as a competitor to Spotify, in music streaming, and Netflix, in video streaming, it could discover a new source of revenue growth, with strong operating margins. Founder Playthings: The most cynical view is that the billions invested in these businesses are not meant to make money, but instead were directed by founder interests in electric cars, health care technology and home automation. Those who take this view will likely point to Google Glasses, an expensive and ill-fated experiment that ended badly and to the effusive support from Brin and Page for these businesses. If you buy into this this view, not only will these businesses not add value to Alphabet, they will continue to drain value from the company, because of the spending that goes with them. Early Life, Big Market Businesses: The second and more optimistic view is that the Google bets should be viewed more as start-ups in potentially big markets, with industry-leading innovation. This is especially the case with Waymo, which if not at the cutting edge of the driverless car business is very close to it, and if successful, could be an entree into not just the driverless car market but also into ride sharing and car service. You could build business models for Waymo, Verily, Nest and Google Fiber that would resemble the models used to value young start-ups, with a bonus of access to Alphabet capital to survive for long periods, and add this value to the advertising business that remains Google's cash cow. Real Options: The third view, which splits the difference, is that while the bet businesses represent potential, that potential is not only far in the future, but may never materialize, either because of the evolution of technology, regulation or market demand. Thus, driverless cars may never quite make it into the mainstream, either because customers don't trust them or they turn out to be too risky. 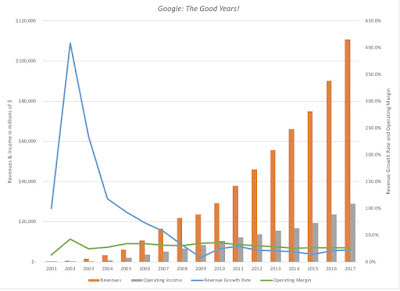 With this view, you can argue that the Google bets are out-of-the-money options, and since the value of an option is determined by potential revenues and uncertainty about those revenues, they are valuable, even though only one of the bets may pay off and the others will have to be written off. In my valuation of Alphabet, I have implicitly assumed that the company will continue to spend billions in its bets, by leaving the margin at existing levels; remember that the operating margin of 27.87% is after the company's spending on its bet businesses. By not explicitly giving credit for the revenues that the bet businesses will create, it may seem like I am taking the cynical view of these businesses as playthings, but I am not. Much as I dislike the corporate governance ethos that Brin and Page have brought to Google, and helped to proliferate across the new tech sector with their dicing and slicing of voting rights, I don't see them as individuals who would spend billions on expensive toys. That said, I do think that trying to build business models from scratch, to value Waymo, Verily and Nest is difficult to do right now, given that the markets that they are going after all still in flux. I believe that these investments are options and valuable ones at that, but I will make that claim based upon their underlying characteristics (high variance, big markets) rather than with explicit option pricing models. 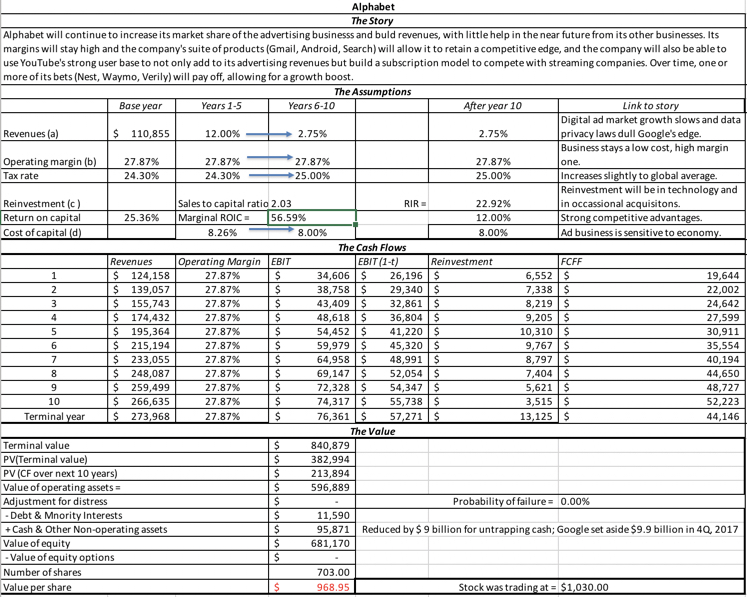 As an investor, looking at Alphabet, here is how it plays out in my investment decision. My intrinsic valuation for Alphabet is $968, within shouting distance of the company's stock price, and I believe that there is enough option value in the bets, that if the stock is fairly or even under valued at its current price. While I am not yet inclined to buy, I have a limit buy order on the stock, that I had initially set at $950, but have moved up to $1000 after my bet assessment, and I, like many of you, will be watching the market reaction to the Alphabet earnings report on Monday. Perverse though it may sound, I am hoping that there are enough negative surprises in it to cause a price drop that would make my limit buy execute, but if not, it will stay it in place.